That dish looks so good, I wish I could have some. Oh yum these looks absolutely delicious - I'll have to give it a whirl and see what it tastes like. Looks delicious.. I make it with spinach.I have never seen kale here in Brazil. Would love to try it out. The sort of simple and tasty food that I like Nayna. This dish sounds delicious, I love the twist of adding kale too. I think if I tried this recipe it would quickly become my new most favourite dish ever! I love all the spices here, and oh my goodness, yes please! Yum! A tasty recipe and one that I love, a good Tarka Dhal is a thing of beauty and I love your version with kale! Love this, especially with the addition of kale- bet it disappeared fast! This looks like the kind of dish my husband would love and beautifully photographed too. Looks like a delicious big bowl of comfort food with a healthy twist. oh this sounds delicious and looks utterly amazing! Dal looks absolutely delicious. With the addition of kale makes it more nutritious. 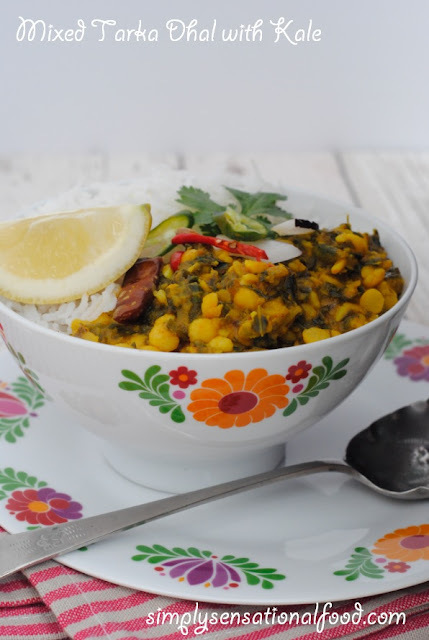 Oh what a great idea...I love tarke dhal and love kale so a perfect combination. Delicious. I bet that was lovely, I do like a dhal and love that you have different types of legumes combined. Ooh, my kind of food Nayna and you've made it look quite beautiful. I'm not a fan of that kind of food, but I'm sure my hubby would, he enjoys them! I'm not one for chickpeas, but I bet it'd be a tasty dish for those that are. I could eat stuff like this every night. My family would probably complain but I could eat pulses every single day and never tire of them. 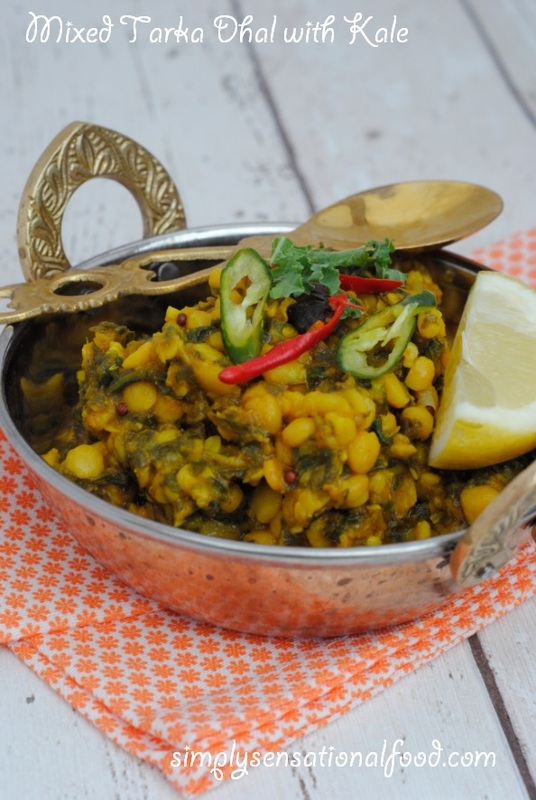 This looks fab and I must put some kale in my next daal instead of spinach! What an amazing bowl of food it looks stunning and your food styling is sensational too. Looks amazing as always! I'm curious. Do you use a pestel and mortar?